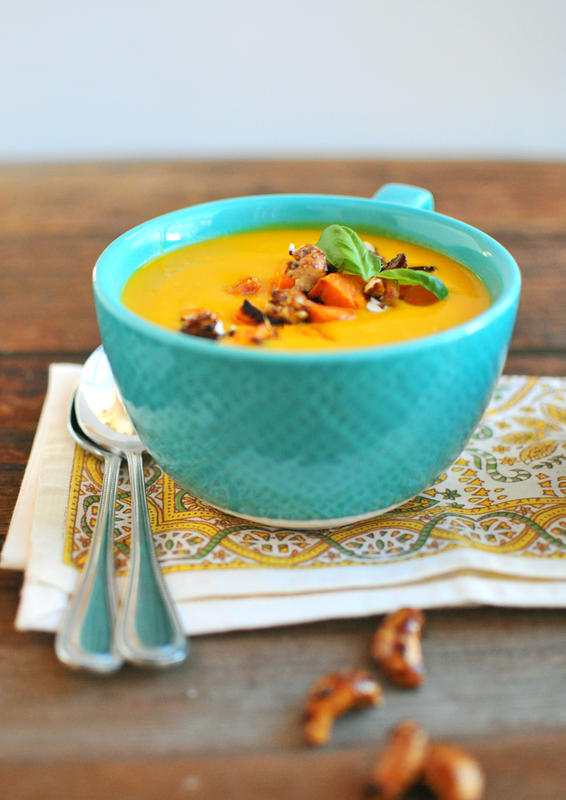 This carrot ginger soup is suuuuuuuuuper creamy because of the Silk cashewmilk and the roasted sweet potatoes. It's topped with ginger molasses cashews, roasted veggies and fresh basil. 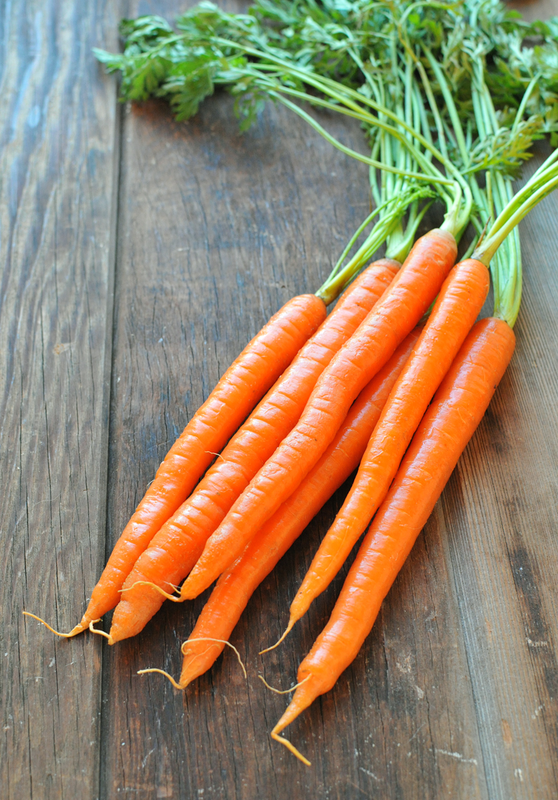 It starts with fresh organic carrots, like these. Then they are roasted to perfection at 425 degrees. Roasting them brings out their natural sweetness and makes the soup even creamier! Aren't they so gorgeous?! 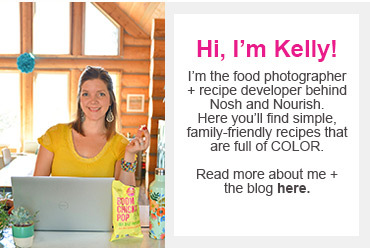 Hip hip hooray for beautiful, nourishing food!! Combine the carrots, sweet potatoes, garlic, fresh ginger, lime juice, and Cashewmilk in a high-speed blender and give it a whirl. Then, there's one more important step to creamy soup perfection. Dear Hubby doesn't like soups that are too thick, because they remind him of baby food. Well, this one is uber creamy, but without being too thick. The trick? Add 1 cup of coconut water (or water) at the end to thin it out. I love using plain unsweetened coconut water because it is packed with potassium and other good-for-you nutrients! Some people don't like the taste of it by itself, but in a soup like this, they'll never know! 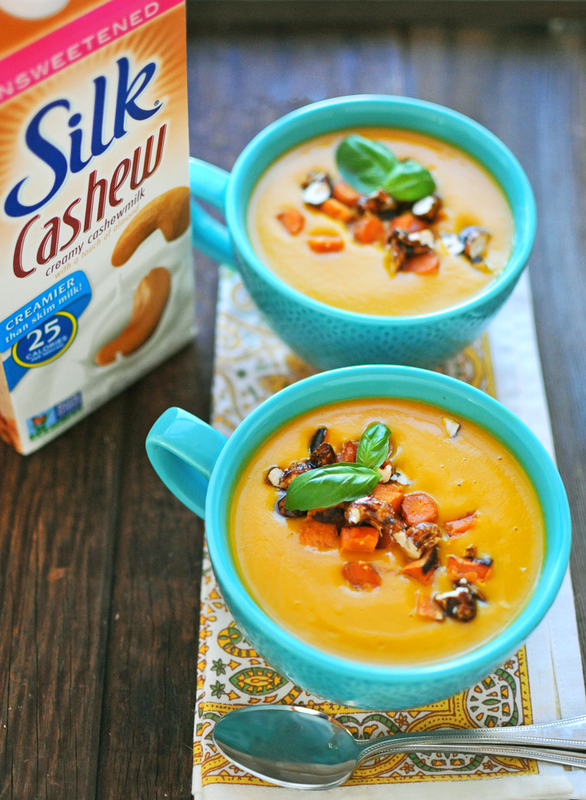 Have you tried Silk's (relatively new) cashewmilk? It's my fav. I use it in everything --- my coffee, my smoothies, in soups, and in salad dressings like this one. And it's so low in sugar... as in ZERO grams of sugar! And I know... this is a little bit different than my "usual" photography. 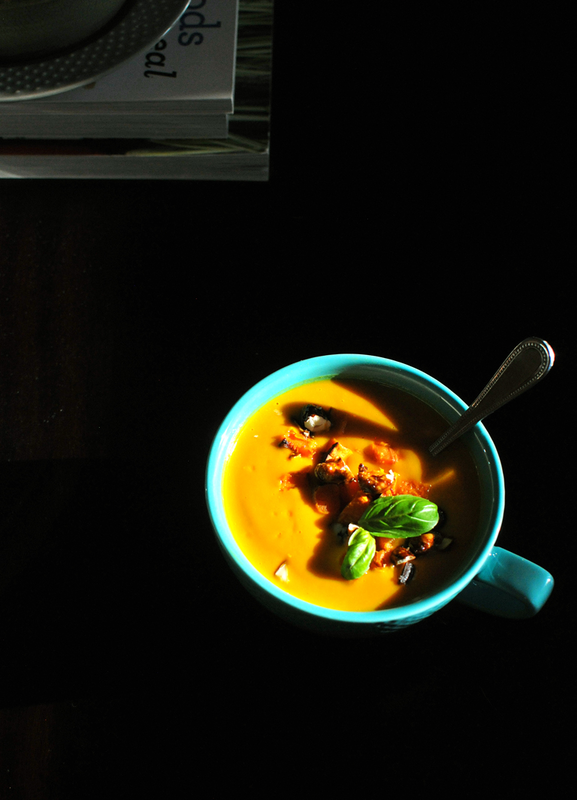 But I was so smitten with the gorgeous sunlight pouring over my bowl of soup at the dining table that I had to take a pic before diving in! Want to try Silk's Unsweetened Cashewmilk yourself? 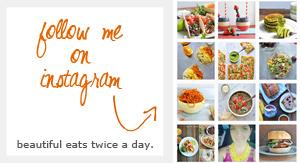 Grab a coupon here! 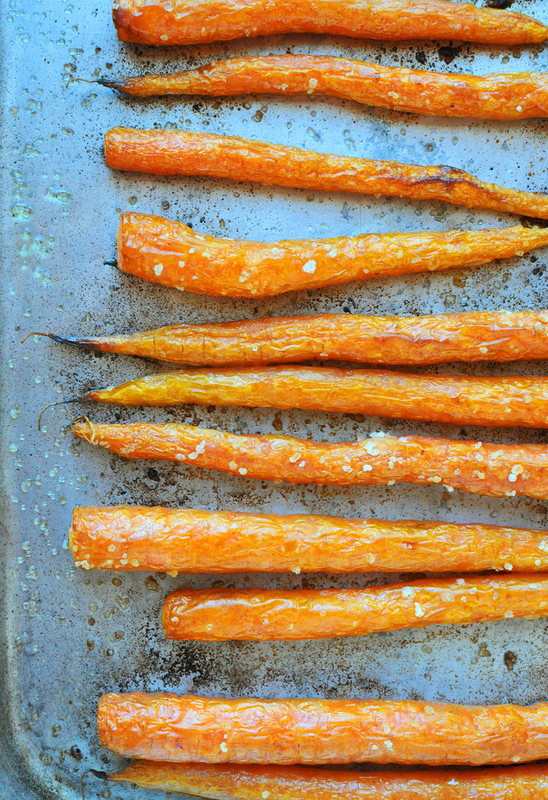 Line carrots and sweet potato in a single layer on a baking sheet. Brush with olive oil and sprinkle on sea salt. 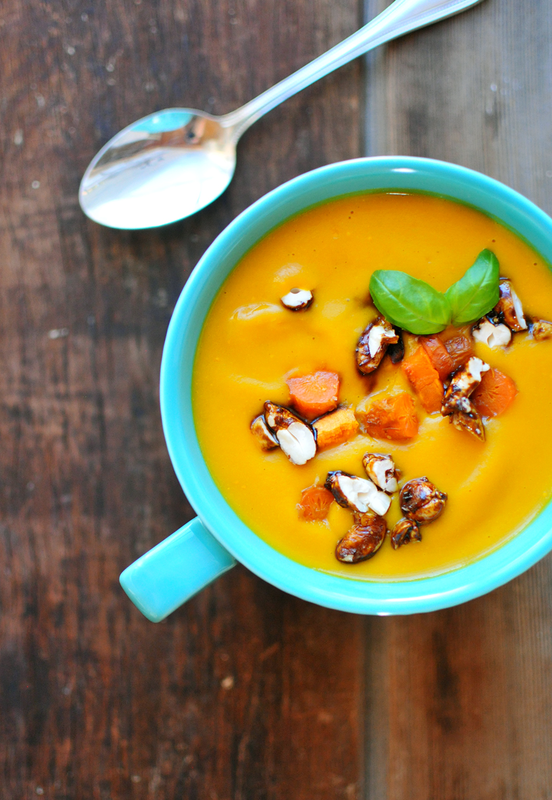 Set aside one carrot and one slice of roasted sweet potato to use as a soup topper. Combine the rest of the roasted carrots (cut in half), sweet potatoes, cashewmilk, garlic, ginger, and lime juice in a high speed blender. (I have a blendtec and used the hot soup function). Make sure your lid is on tight! Pour the blended mixture into a medium stockpot and then stir in the coconut milk. Let the soup warm up over medium heat for approximately 5 minutes. Serve hot with fresh basil leaves, the roasted veggies you set aside in step 4, and ginger molasses cashews. Preheat oven (or toaster oven) to 350 degrees. In a small bowl, combine all ingredients except the sea salt. Stir until all surfaces are evenly covered. Lay the cashews in a single layer on a piece of aluminum foil. Sprinkle with sea salt. Remove from heat and then let cool/harden completely.